Arrows fly, swords clash, nobles and churchmen are gulled out of their coins, and the French and Venetians are successfully blamed for things they did not do. 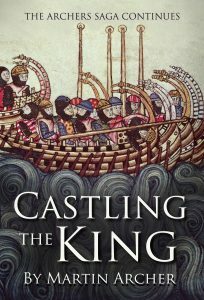 Castling the King/The Sea Warriors is another exciting book in the action-packed saga of Cornwall’s Company of Archers at the dawn of Britain’s military supremacy and the beginning of its great merchant companies. It is an enjoyable and often witty read that sticks pins into the Church and nobility along the way.